Sequential 2 is a gift for the glitch-happy producer, generating an endless array of unpredictable sounds from anything you care to feed into it. Perfect for experimenting. Decent results and presets. Can't combine multiple effects at once. The latest Audio Unit effects plugin from Sinevibes (still no VST or Windows support, sadly) is a redesign of one of its previous successes, and while ease of use has always been a tentpole of the Sinevibes philosophy, Sequential 2 is probably its most intuitive device yet. 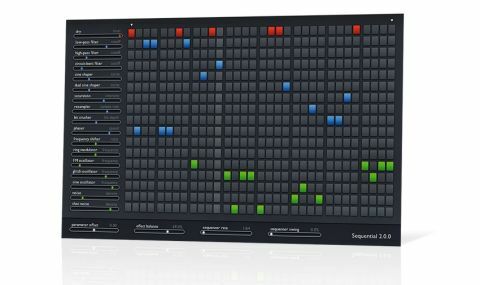 An effects sequencer with an understated appearance and a minimalistic control set, there's really not much to it: 16 effects processors each get a lane on a sequencing grid, which can be up to 32 steps long and run at speeds up to 1/64 per step. By activating a step on any lane other than the Dry one at the top, the effect on that lane is applied to the incoming audio signal, enabling tempo-synced 'hocketing' between effects. It's as simple as that. "The effects comprise the usual filters and bitcrushers, as well as some more intriguing modules"
The effects comprise the usual filters and bitcrushers, as well as some more intriguing modules. Circuit-bent Filter is a deliciously broken low-pass, while Glitch Oscillator seems to be some sort of sample-and-hold oscillator, and Sine Shaper and Dual Sine Shaper are a characterful pair of waveshapers. Each effect has just one control - Cutoff for the filters, Curve for the waveshapers, Speed for the Phaser, etc - and all have been tuned to a specific range in order to give consistently usable results. Don't misinterpret "usable" as "always pleasant", though, as Sequential's output ranges from gently edgy to spectacularly aggressive. A dry/wet mix control helps to keep things under control. Sequential comes with just shy of 50 presets, but the whole sequencer can be randomised at a click, which - given the highly source-dependent nature of the plugin - is a great way to get started with a new patch. It's also worth noting that it's 'monotimbral', in that you can only activate one effect per step - obviously, we'd love to see the ability to combine multiple effects at once.